More often than not, at any one time in our lives we may have experienced being sent a collection letter. It could be from a utilities company, from an overdue credit card debt, or from a mobile phone company. 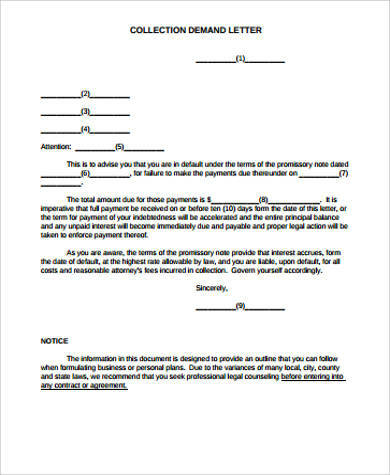 When a customer makes an unexpected delay in paying his or her dues, chances are a collection letter asking for payment of the amount due is sure to follow. 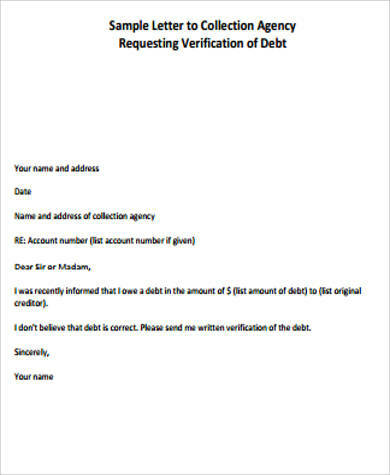 Our Sample Letters for collection of debts have a couple of examples that a collecting company can use for their clients. These come in different forms and are meant to be friendly and persuasive at the same time. These are all available free for downloading and can be edited and modified to the user’s specifications. 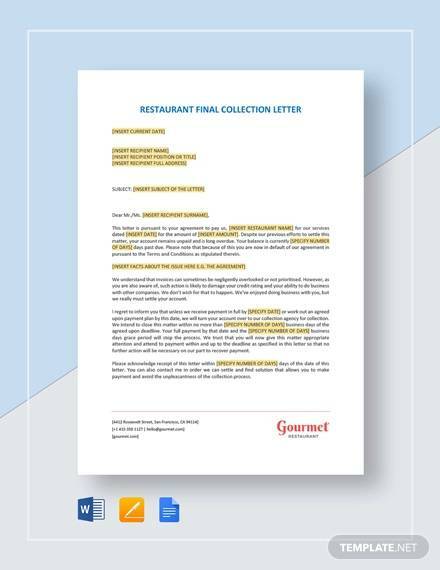 Unless as a last resort when every kind of persuasive collection letter fails to make the customer respond, it’s best to write the collection letter in terms that are thoroughly tactful but with a sense of urgency. This is so that the customer will not be put off or threatened to the point that he or she may not be willing to respond anymore. 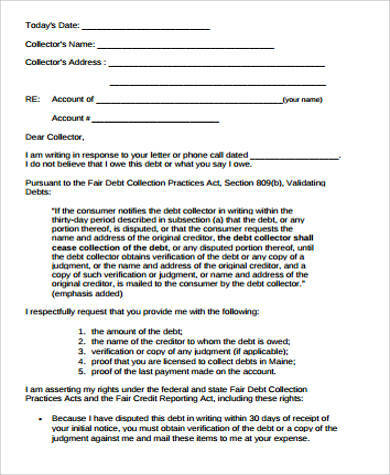 A collection letter is meant to remind and request the customer to pay the overdue amount, and instead of just one collection letter, most collection agencies send a series of letters. 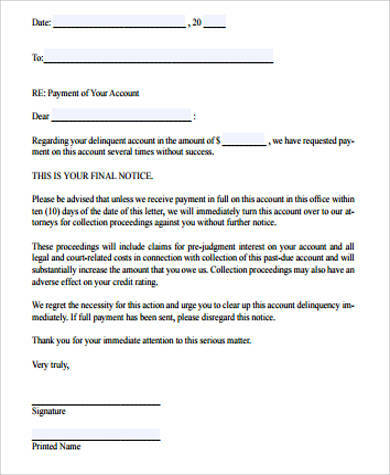 These series of letters being sent usually begin with a simple reminder and end with a warning letter indicating legal action only when a series of letters go unanswered and the debt still has not been paid. 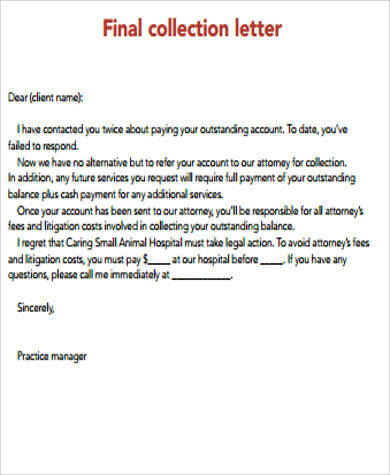 For a collection letter to be effective, the first in a series of letters should begin with a first letter giving the statement of account to remind the customer that he or she is remiss in paying his or her dues. The second letter will be a reminder that payment has to be made in order for the customer not to be able to incur penalties for the overdue account. 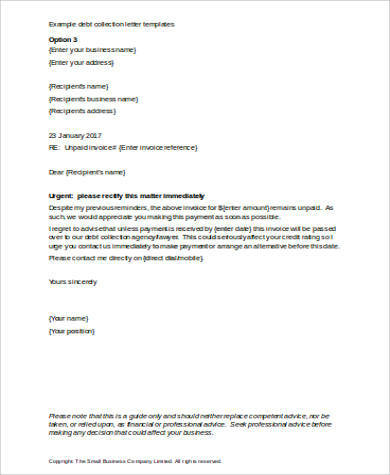 The third letter would be a sort of inquiry and an invitation for discussion to try and find ways to resolve the payment. 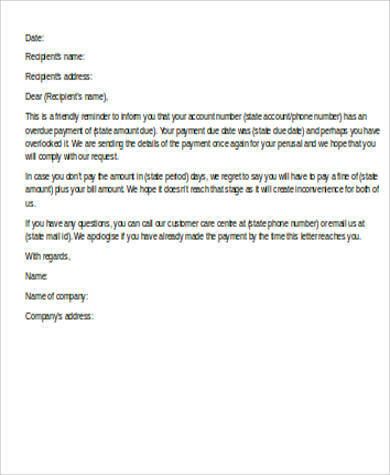 The fourth letter would be an appeal in an urgent manner to remind the customer that the payment has to be settled immediately or there will be consequences. 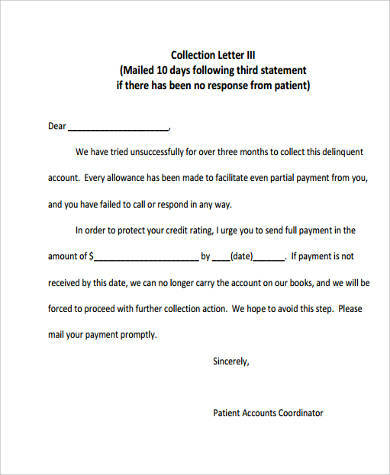 The fifth and final letter would be a demand and warning of legal action should the customer continue to ignore repeated attempts of collecting his overdue payment. Our website’s Collection Letter Samples will show the examples given above how each of the letters must be carefully prepared to be courteous and demanding at the same time. 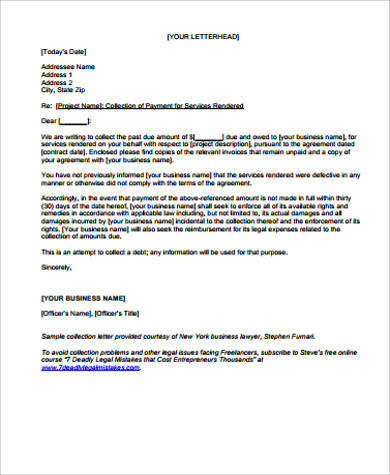 For a collection letter to be effective, it’s important for the company’s collection agency involved that the utmost goal is to retain the customer even if he or she has failed to pay on time. A room for consideration has to be allowed before any threat of legal action is being given. For most credit card companies, one of the most effective ways in making customers pay their overdue accounts is to offer a debt restructuring deal. This is often the most approachable tactic that can be used to great advantage, by presenting customers the opportunity to pay their dues on a staggered basis. 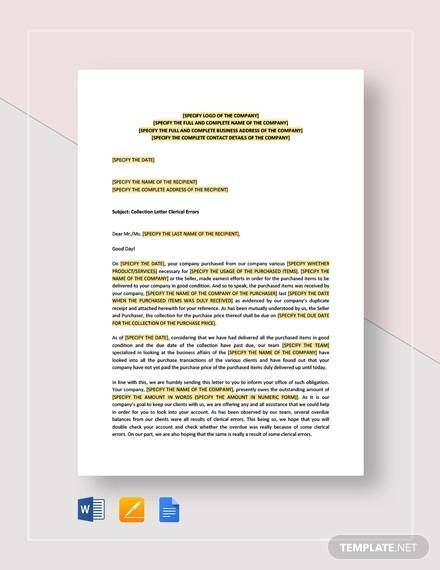 For businesses looking for letters to end their existing contracts with less than desirable suppliers among other cases, our website also offers free downloadable Contract Termination Letters. These can be downloaded in both Word Doc and PDF files.